Looking for an affordable Carpet Cleaner in the Carlingford area? ​Chem-Dry Clean & Fresh Carpet Cleaning Services Carlingford is a leading Chem-Dry franchisee from the North-West region that is committed to giving you the best possible cleaning results along with a friendly & honest service. Fully trained and insured we care about your carpets and fabrics using only the best equipment and environmentally friendly solutions. This means you receive 100% Green & Eco-Friendly PH Neutral carpet cleaning that will not harm your children or pets. New Deodorise formula smells like 'real oranges' - you'll be hooked:) - included Free of charge. Have your carpets cleaned and protected on a regular basis- Act Quickly - The longer the stain is allowed to remain the more chance it has to set. - Remove as much excess stain as you can by blotting, scraping or brushing whatever will come off. DO NOT rub it in. - Call Chem-Dry Clean & Fresh for expert spot & stain removal if these efforts do not work. ​Does a family member in your home suffer from allergies? Do you have children who love to play on the carpet? Carpets absorb and collect common allergens and germs that can spread illness, cause allergies and make asthma symptoms worse for you and your family. 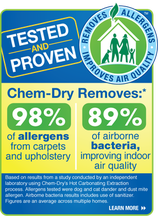 Chem-Dry Clean & Fresh Carlingford can reduce tough odours and allergens, leaving your carpets clean and healthy.